How many of you have New Year’s Day traditions? Christmas, sure. Thanksgiving, yup. Easter, ok. But New Year’s Day? New Year’s Eve gets most of the love and January 1 usually is a day to relax and unwind. In the Southern US, one New Year’s tradition is to eat black-eyed peas for luck. Apparently, it represents fertility. Eating greens symbolizes wealth and pig represents a link to slavery. All three components are typically eaten together in a dish called Hoppin’ John for a lucky new year. Personally, any time one eats beans and greens it is a reason to celebrate. I’ll pass on the pig, please. As the year of the bean concludes (or is just beginning), it is nice to revisit some new finds. My mom introduced me to black-eyed peas when she made them as Mango BBQ Beans. They were much nicer than the kidney beans. Small, yet meaty, they paired well with the sweet and smoky baked beans. Since then, I have been hankering to cook with them some more. 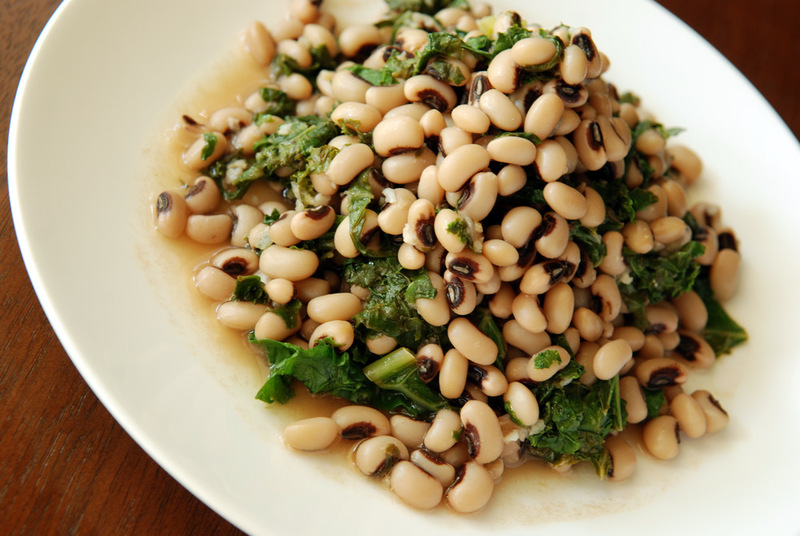 This recipe for garlicky and lemony black-eyed peas and kale was so good Tess included it in both Radiant Health, Inner Wealth and The Two Week Wellness Solution (and on her blog here) and my slightly adapted recipe follows. If you use canned beans (or peas? ), this is a wickedly fast recipe to make. However, I made my own BEPs from scratch. Adding the vegetable broth, bay leaves and onion really boosts the beans since it all gets absorbed by the beans. Combined with the garlic, lemon, and kale, this is a tasty pot of beans that is low in fat but full of flavour. Yes, there are 6 cloves of garlic, but they are cooked and more subdued. You can eat it hot from the pan, but I preferred the chilled leftovers – perfect for lunch on New Year’s Day or your next potluck. Black-Eyed Pea and Barley Stew from What Would Cathy Eat? 1. If cooking your own beans, place beans, onion, broth, bay leaves and kombu in a large pot and bring to a boil over high heat. reduce heat to low and simmer for 45-60 minutes until tender. 2. Once the beans are done, remove the majority of the water (save it for a lovely vegetable broth! ), leaving 1/4 cup or so in the pot. Stir in the kale and garlic and cook over medium-high heat for 5 minutes, until the kale wilts. Remove from heat. 3. Stir in the salt, nutritional yeast, olive oil and lemon juice. Top with hot sauce (or chili flakes) if you so desire and serve. Personally, I preferred this chilled as leftovers. In Georgia we are specific about our greens – they have to be collards for wealth. Who knows where that started… but they would be delicious in this! I’ve never participated in the BEP’s on NYE tradition, but this definitely sounds like the most delicious way to do it! Lentils are something I usually make for New Year’s Day (for luck). However, I love black eyed peas and for some reason I don’t utilize them much in my cooking. I will have to change that for 2012! I’m fairly certain I will never ever tire of beans or greens..so I’m excited to see what 2012 will hold! I love the simplicity of this dish. Sometimes all you need is garlic, lemon and some good healthy beans. Oh yes please. This is a wonderful salad. Happy New Year Janet! You’ve seriously got me craving bep’s now, all those recipes sound delicious!! Happy New Year Janet! This slad looks like the perfect healthy way to kick off 2012. 😉 Mahalo for sending it along to Souper Sundays. I love black eyed peas. I usually cook mine from scratch too – I usually cook up a big batch in the crock-pot and then freeze them in smaller quantities in snaplock bags. I obviously need to whip a bag out of the freezer and give this a try – no kale round these parts right now, but figure this would be just as good with spinach. This was absolutely delicious, and I am not generally a fan of kale. I may turn around and make a double recipe tomorrow. Thank you! 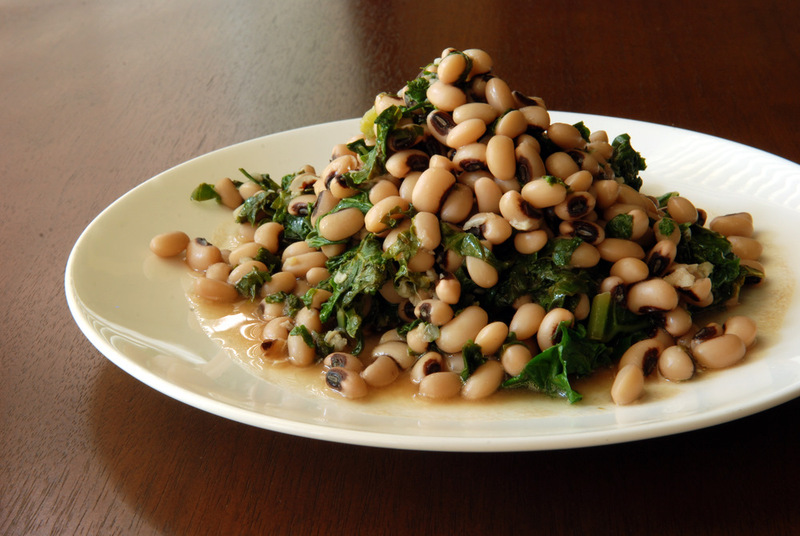 We recreated this flavorful dish using dino kale and black eyed peas from the farmer’s market. It was so simple to make and bursting with flavor! What a delcious recipe. Great way to get your vitamin K and protein for the day. Thanks, can’t wait to try this. Please – do you mean 1.5 dry BEP, soaked, or 1.5 soaked BEP? Thanks! Edited to be clearer – 1.5 cups before or after soaking? Thanks! Hi Beth, I measure them first when dried and then I soak them. I hope that is more clear. Thanks, just made it up and it’s delish! I halved the garlic to three cloves and it’s still garlicky enough for me.